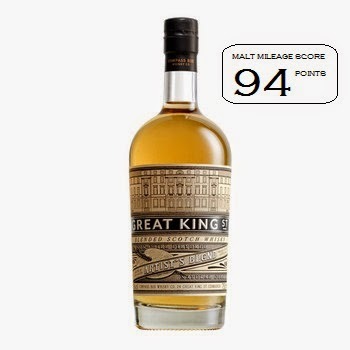 The Great King Street Artists Blend is a blended Scotch whisky, which means that it is comprised of both malt and grain whiskies. Produced by Compass Box Whisky Co, the whisky is a blend of different whiskies (46% is Lowland grain whisky, 45% Northern Highland single malt and 9% Speyside single malt) that have matured in different oak types (mostly American oak, with 66% from first fill American oak, 26% from whiskies finished with French Oak and 8% from first fill sherry buts). The use of these whiskies and oak types indicates that Compass Box aimed to produce a whisky of great complexity. They have succeeded. The whisky itself is elegant, smooth, complex and silky with an inviting nose – the kind of whisky you want to melt into a lounge with, remote control in hand. The American oak provides the foundation of this blend, with gentle vanillas and raisin notes mixed with chocolate. The use of French oak is a masterstroke, because it seems to give the whisky a toasty edge with hints of spice that are softened by the dried fruit and winy nip from the sherry butts. The malt content of the whisky also seems high, and the clean fruity malts meld together beautifully with the more aromatic heavier malts to create a whisky that is light yet substantial. At £25, or $50, this whisky is an absolute bargain – a must try. Nose: Waves of vanilla with cherry cough drops and dried fruit (dates and raisin) combine with chocolate, herbaceous mint sauce notes, honeyed ham and flashes of peppery spice. Taste: Smooth, light and extremely palatable, the milder grain whisky takes the lead on the entry with vanilla, caramel and toffee but it is followed closely by the grassy malts and the heavier fruity malts. At mid-palate the wood becomes more dominant, adding spice and richer chocolate notes with hints of tannic herb. Finish: Toasty, with slowing dying spice, cocoa and coffee notes supported by dried fruit counterbalanced by the more bitter wood tannins.